Then-FBI Director James Comey testified in front of the Senate Judiciary Committee during an oversight hearing on the FBI on May 3. But a month ago, he said this to the Senate Judiciary Committee: "I'm talking about a situation where we were told to stop something for a political reason, that would be a very big deal. It's not happened in my experience." Why did Comey say he has never been asked to stop an investigation for political reasons after that conversation with Trump? Some writers on the Internet, particularly Comey critics, have a couple of simple explanations — the memos are fake or he perjured himself in front of Congress. But there's more context. Here is the full exchange from the Judiciary Committee hearing, when Comey was being questioned by Sen. Mazie Hirono, D-Hawaii. COMEY: Not in my experience. Because it would be a big deal to tell the FBI to stop doing something that — without an appropriate purpose. I mean where oftentimes they give us opinions that "we don't see a case there and so you ought to stop investing resources in it." But I'm talking about a situation where we were told to stop something for a political reason, that would be a very big deal. It's not happened in my experience. Hirono's question was very specific — referring to "the attorney general or senior officials at the Department of Justice" — and not the president. There's been no indication that officials at the Justice Department applied pressure to Comey to stop any part of the Russia investigation. What we have learned from Comey associates is that he wrote a memo shortly after a private meeting with Trump in February, in which Comey recounted Trump saying, "I hope you can let this go." This was just after national security adviser Michael Flynn was forced to resign after misleading Vice President Pence and others regarding his interactions with Russian Ambassador Sergey Kislyak. Trump's comment to Comey was said to refer to the investigation of Flynn as part of the FBI's larger Russia probe. As NPR's Carrie Johnson reported, Comey recalled giving a nonresponse and wrote a "very, very detailed" memo to recount the meeting shortly after. Comey is known to keep such memos to record important professional episodes, like the night in 2004 when he stopped senior members of the Bush administration from reauthorizing the domestic surveillance program without proper approval. Congress wants to see Comey's memos regarding his meetings with Trump. In legal proceedings, such contemporaneous notes can hold a lot of credibility. But the White House has vehemently denied Trump ever said anything that would pressure Comey to back off of Flynn or the larger Russia investigation. "While the President has repeatedly expressed his view that General Flynn is a decent man who served and protected our country, the President has never asked Mr. Comey or anyone else to end any investigation, including any investigation involving General Flynn," a White House official said in a statement. "The President has the utmost respect for our law enforcement agencies, and all investigations. This is not a truthful or accurate portrayal of the conversation between the President and Mr. Comey." It seemed to some that Comey's statement before the Senate Judiciary Committee just before he was fired may have affirmed the White House's position, because that quote was often heard without the question. 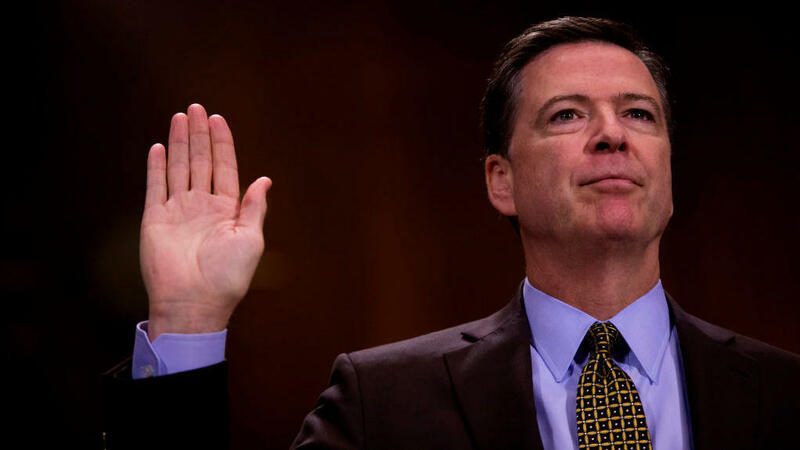 When Comey re-emerges in public before the Senate Intelligence Committee on Thursday, he could well be asked whether he was lying in his earlier testimony. But given Hirono's wording and Comey's well-known attention to detail, he may simply say that he was answering the question he was asked.